Video conferencing has become a robust and varied business practice in the past several years. As technology has advanced and more companies have noted the potential in expanding video conferencing products, capabilities of a video conferencing system have multiplied at an impressive rate. Not long ago video conferencing was little more than connecting two cameras and allowing a remote employee to view a conference room, or linking two conference rooms together. Now, video conferencing systems are capable of linking multiple sites. Documents can be shared and even annotated across these sites in real time. Cameras can automatically zoom and pan to give the best view of a speaker or a room, while audio equipment can adjust based on the action or inaction or a participant. That’s all well and good for the office. Often these capabilities are not only helpful, they’re required. It’s a lot easier for a company to purchase and install these systems than it ever has been, and as a result video conferencing meeting have the ability to be more beneficial than ever. However, it is not all times that these capabilities are a necessity. Sometimes it’s a simple exchange needed, and a simple solution will do the trick. Imagine two mobile employees are on the road and want to video chat quickly and comfortably. They don’t have the equipment or the need of these systems. But they do have a smartphone. 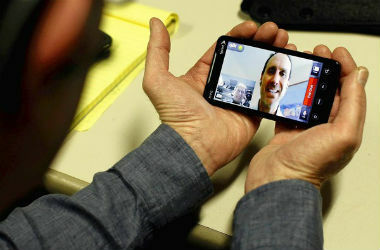 There are several apps that can serve the purpose of a video chat that are readily available for smartphones. While you may not be able to share documents or work together on content over a long distance, you will be able to speak with colleagues remotely, go over pitches, work through problems, etc. We’ve compiled a list of some of the best basic video conferencing apps for your mobile phone. Click on the images below or the 'Next>' link above to view the slideshow. This article was originally published by our content partner Corporate TechDecisions. We give you six apps to help you share files at work and at home. Help keep your own and your employees’ BYOD units secure with these eight anti-virus apps. Music apps for the Mac and PC. From a simple 10-band equalizer made for Spotify to a simple volume booster to full-on audiophile applications that tout bit-perfect audio output and promise to output your CDs, your HD audio (88.1 KHz, 176 KHz, and more), your DSD, and any other audio perfectly to your DAC. And how about that dithered bit depth reduction! The apps you must have to watch live sports and TV shows on your iOS and Android smartphone and tablets. Thank you for the above list of apps. Additionally, you may also try a R-HUB desktop video conferencing server. It works on Android, Windows, MAC, iOS etc.